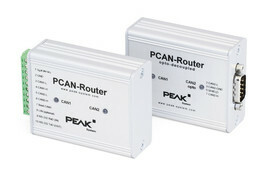 The PCAN-Router is a dual-channel CAN module whose NXP LPC21 series programmable microcontroller provides the option of using the CAN messages on both channels on a flexible basis. This gives a whole range of options for manipulation, evaluation, filtering, and routing of CAN messages. Using the supplied library and the Yagarto GNU ARM toolchain (contains the GNU Compiler Collection GCC for C and C++), custom firmware can be created and then transferred to the module via CAN. At delivery, the PCAN-Router is equipped with a demo firmware that forwards CAN messages 1:1 between both channels at 500 kbit/s. The corresponding source code is included as example in the scope of supply. The module is installed in an aluminum profile casing, and is shipped in versions with two D-Sub connectors or a screw-terminal strip.